LaCie doesn't waste time with elaborate naming conventions. 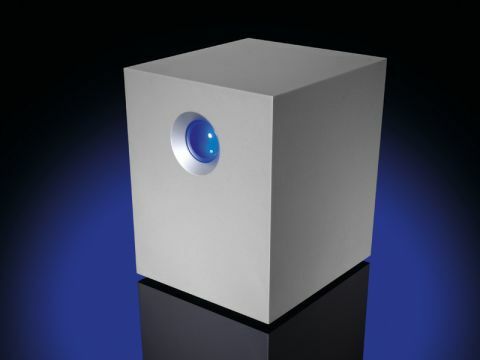 The 4big is exactly that – a big metal cube containing four hard drives. The Quadra part denotes its four connectivity options – USB, FireWire 400, FireWire 800 and, most notably, eSATA, offering up to 3Gb/sec data transfer speeds. Apple has yet to embrace eSATA, so in order to make use of this new highspeed transfer protocol you'll need to factor an expansion card into your budget. Any Pro-range Mac is good to go, with either ExpressCard/34 or PCI-E available for around £40. While its purpose may be mundane, this isn't a unit designed to be tucked away out of sight; its sleek aluminium shell complements any Apple kit beautifully. Airflow is reassuringly well thought out, considering the valuable payload. The fans inside are temperature controlled, only audible during intense disk operations. By default, the 4big is configured as a RAID 0 device, writing data evenly over all four disks. As a result, it's capable of an uncached, 256k block random write at an impressive 132MB/sec over eSATA. It's certainly fast, but it's also a very, very bad idea if you're looking to store any important data on the device. While you get the capacity you've paid for, if a single disk fails you lose everything. The most useful of the seven RAID modes the 4big offers is RAID 10 – that's a nested level containing a stripe (RAID 0) of two mirrors (RAID 1) – although half the 4big's capacity is sacrificed as a mirror. This creates a single mountable drive in which up to two of the four physical disks can fail without data loss occurring. Of course, in this mode you lose the high transfer speed – the same uncached write under RAID 10 completed at 70MB/sec, almost half the speed of RAID 0, although still fast enough to handle real-time encoding of uncompressed HD video. Despite this, it's still hard to get over how expensive the 4big is. Even with the inflated drive prices taken into account, the base unit is still over £300 more than its obvious rival, Data Robotics' Drobo, filled with four 1TB drives. And unlike the Drobo's ability to expand as your needs grow, here you're investing in a set capacity – and as soon as you start dividing it by two, the 4big loses its 'bottomless pit' image. What it's far more suited for is temporary storage – in RAID 0 it's fast enough to handle multiple HD video and audio streams, making the 4big Quadra one of the speediest solutions available.